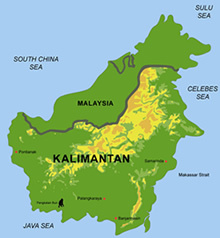 Vast areas of peat swamp forest (PSF) cover the coastal plains of Central Kalimantan from the coast at the Java Sea up to the provincial capital of Palangkaraya. PSF is among the earth's most endangered ecosystem, has a huge carbon storage capacity and is extremely fragile to disturbance (1). With the establishment of the Mega Rice Project (MRP) many people were able to access the previously inaccessible interior of this peatland landscape to exploit the residual timber resources, mostly doing this on illegal basis and using fire for land clearing. In summer 1997 and 2002 land clearing was initiated by means of fire as the most economical method. Enhanced by the El Niño Southern Oscillation (ENSO) in 1997 and 2002, many of these fires set for land clearing spread into opened forest areas where they continued to burn with greater intensity. 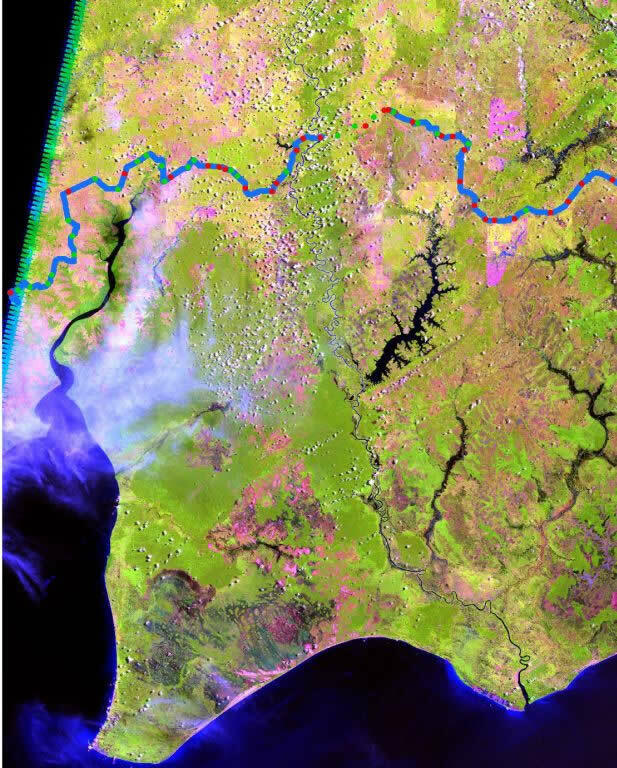 The detailed multi-temporal analysis of several LANDSAT ETM images acquired between 1999 and 2003 shows the quick change in this largest remnant of tropical peatland and very high rates of deforestation. Four ETM images, 118-61, 118-62, 119-61 and 110-62 in Central Kalimantan and 120-58, 120-59 and 121-59 in Sarawak, Malaysia were compared for 1999 and 2003. It was found that illegal logging increased tremendously between 1999 and 2003 (2). Our analysis shows that previous legal logging operation prepared the ground for further degradation of the forests by fire, illegal logging and farming. In the area between Sampit and Pangkalanbun many Palm Oil plantage were established in the last years on peatland, see Landsat image with tracks and near Kasongan, small scale gold mining took place. If the situation continues as for the past four years there is a very high risk that most of the PSF resource in Central Kalimantan will be destroyed within few years with grave consequences for the local hydrology, climate, biodiversity and livelihood of the local people.